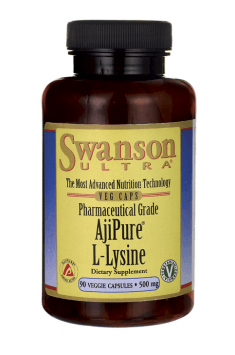 AjiPure L-Lysine 500mg 90 caps. Take one capsule per day with water on an empty stomach. This product is recommended especially for people who are on diets excluding the animal products. In older people it delays the skin aging and increases the bone mineral density. L-Lysine itself does not raise the growth hormone level, however, it does this in combination with L-Arginine in a dose of 1200 mg of each amino acid. Before use, consult your doctor if you have had high cholesterol, gallstones and kidney or liver problems in the past.